Snug Haven Farm, family-owned and operated for over a century, is located in the driftless area in south-central Wisconsin. We are nestled in a valley at the end of a mile long driveway. The valley opens to the south, providing us with ample sun and sheltering us from the harsh north winter winds, hence the name, Snug Haven. After three generations as a dairy farm, we transitioned into a low-tech produce and cut-flower operation as we continue into the fourth and fifth generations of this family farm. Most of our crops are grown within our thirteen hoop houses. Added up, all the land we grow on comprises less than two acres. 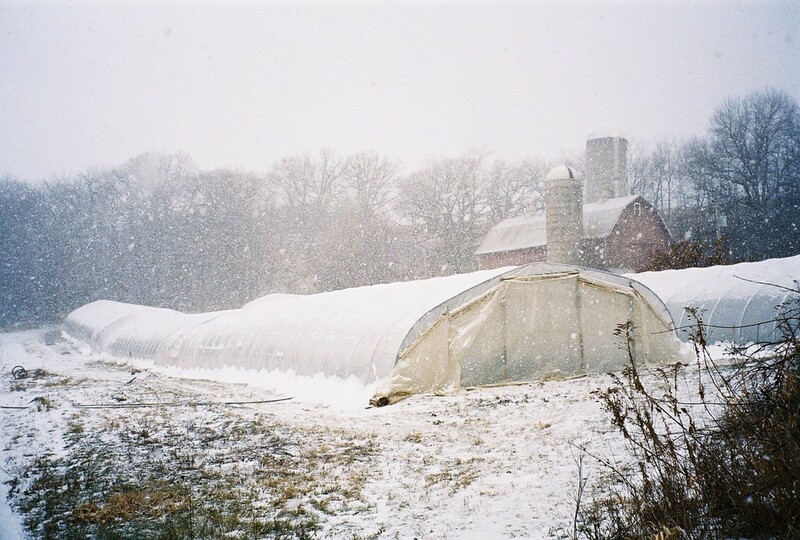 Since the growing season in the area is so short and the need for locally grown products so great during the winter and early spring season, the idea to utilize hoop houses for extended and early season crops has evolved. Known for our "frost-sweetened" spinach, we plant it in September and harvest it from November to May. Due to the freezing and thawing process of the winter clime, the sugar content of the spinach is increased until it becomes incredibly sweet, thick, and hearty. We strive to educate children on where their food comes from and to make it available to people in our area. Current markets include the year-round Dane County Farmers’ Market, restaurants in Chicago, Illinois and Madison, Wisconsin, a winter spinach CSA and a summer flower CSA.